People with autism or other developmental differences can now experience Hope Summer Repertory Theatre in more welcoming, safe and comfortable ways thanks to new resources that make theater-going more sensory-friendly. A year in the making by HSRT Associate Managing Director Reagan Chesnut ’08, the initiative clearly sends the message that live, immersive theatre is accessible for all. Chesnut researched to create tools that would help those with autism and developmental differences. She also consulted with Benjamin’s Hope, a Holland-based “live, work, play, worship” organization designed to address the multifaceted needs of adult individuals and families affected by autism and other intellectual and developmental differences. 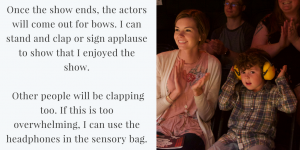 The result is the creation of a three-prong approach to theatre accessibility: Sensory bags, “Going to the Theatre” social stories, and performance guides for use before and most HSRT productions. 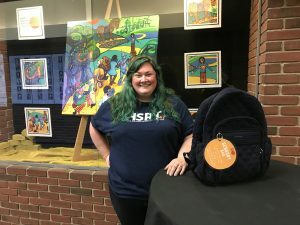 Supplied by accessory giant, Vera Bradley, the sensory bags are equipped with supplies that help patrons adapt to live theatre. 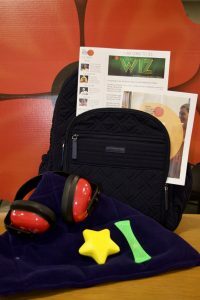 Inside each soft, quilted, durable backpack are noise-dampening headphones, a squeeze stress ball, fidget tool, weighted lap pad, and buttons that say ‘please don’t talk to me’ so a person isn’t approached for audience participation if they don’t want to be. Ten bags are available to checkout at the DeWitt Theatre for every performance of “Dragon Pack Snack Attack,” “The Wiz,” “Godspell” and “The Odd Couple” at no cost. “Social stories” is a term used to describe documents that improve the social skills of people with autism and developmental difference. They tell a “story” of appropriate social interaction by describing a situation with relevant social cues, other’s perspectives and a suggested appropriate response. 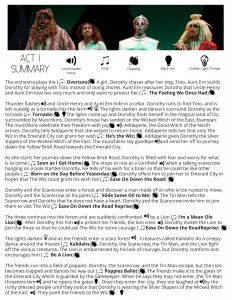 Finally, performance guides walk patrons through the particular sights and sounds of each play with a detailed, chronological summary of the action using icons for sensory triggers. They have been customized for each particular play and indicate when loud noises will occur, or when the house will go dark or suddenly bright, or when anticipated applause or audience participation should happen. Interested in going to HSRT, now in its 47th season? Check out ticket availability online.